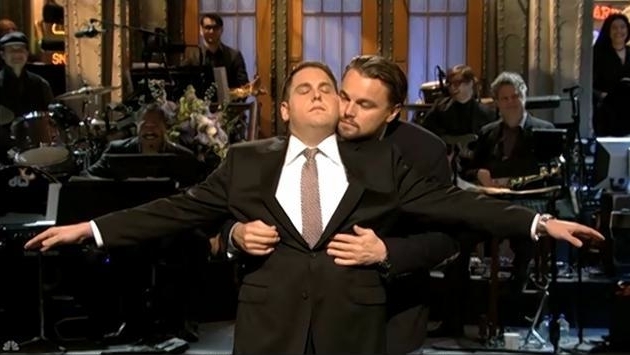 While Jonah Hill's star may be on the rise, his plan to step out of his Wolf of Wall Street co-star Leonardo DiCaprio's shadow went awry as he hit Saturday Night Live for the third time as host on Jan. 25. At the start of the show, Jonah's opening monologue gets interrupted by audience members who only want to ask questions about Leonardo. An insecure Jonah starts badmouthing the actor, but Leonardo walks out onto the stage and tries to rein in Jonah's fragile ego and stop him from acting like such a big shot. To sooth Jonah's nerves, Leonardo agrees to do "that thing [they] did every day [on set]; the thing that always made [Jonah] feel safe." That "thing" is reenacting a very famous scene from Titanic. The scene they reenacted was the iconic moment between Jack and Rose at the front of the ship. Watch it below!